Twenty years ago the Mercedes-Benz SLK-class was born, amid a renaissance of roadsters. The perky SLK distinguished itself within the burgeoning field of baby ragtops by not having a ragtop, but a nifty retractable hardtop. The SLK retained that feature through succeeding generations, during which the car grew larger and more luxurious, with styling that seemed to evolve in lockstep with the larger SL. Now, Mercedes has reconstituted, restyled, and renamed its baby roadster. 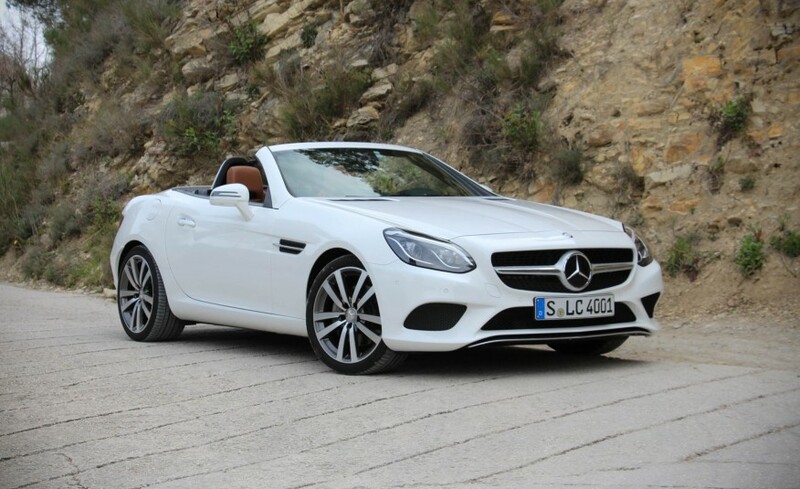 The SLK name is dead; the car is rechristened SLC, something Mercedes hopes will align it more closely with the C-class-and perhaps bring its roadster sales out of the doldrums. 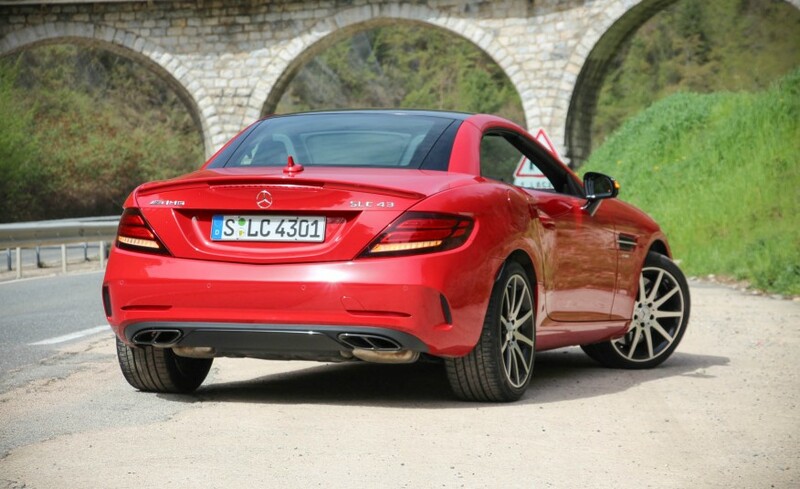 In America, just two SLC-class models will fill the shoes of the three former SLK entries. 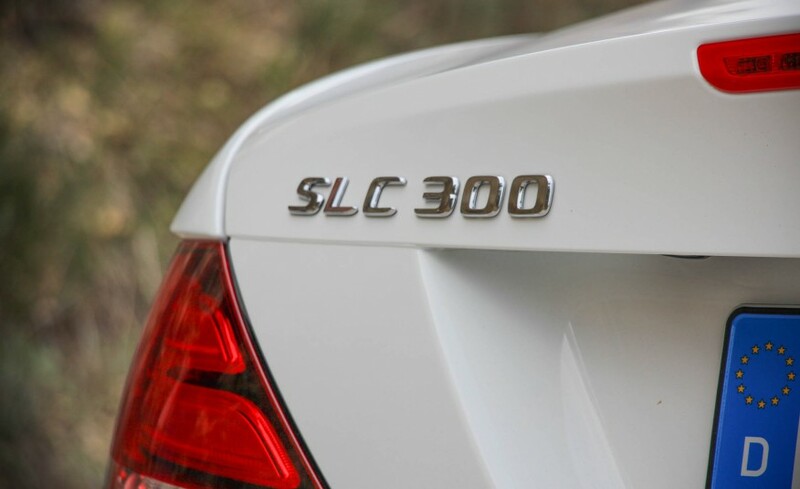 The base SLC300 picks up where the SLK300 left off, powered by the same 241-hp 2.0-liter turbocharged four-cylinder that became the SLK's base engine just last year. 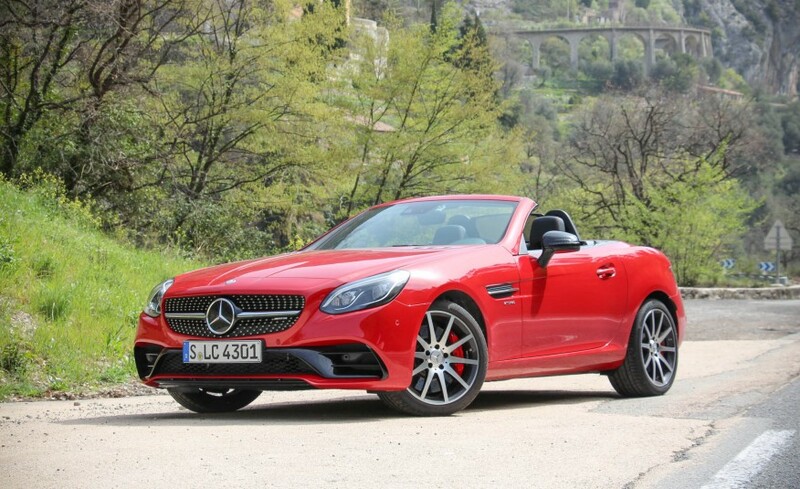 The new Mercedes-AMG SLC43 replaces the mid-level SLK350 and the steroidal SLK55 AMG. The SLC43 is powered by a 362-hp 3.0-liter twin-turbocharged V-6, which just about splits the difference between the SLK350's 302-hp V-6 and the SLK55 AMG's 415-hp V-8. 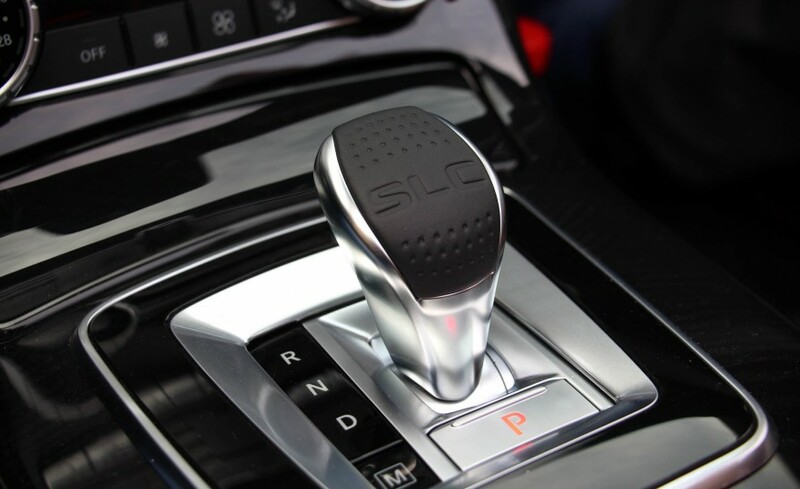 Both SLC models use a nine-speed automatic transmission-a manual is no longer offered. 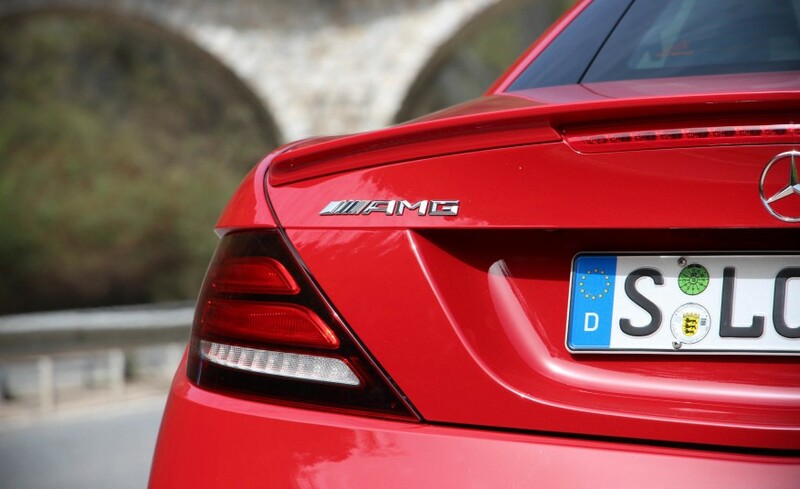 We headed to the French Riviera and its nearby mountains, where Mercedes gave us our first chance to find out if the 2017 SLC-class merits a new name or if it's merely the SLK-class with one different letter. 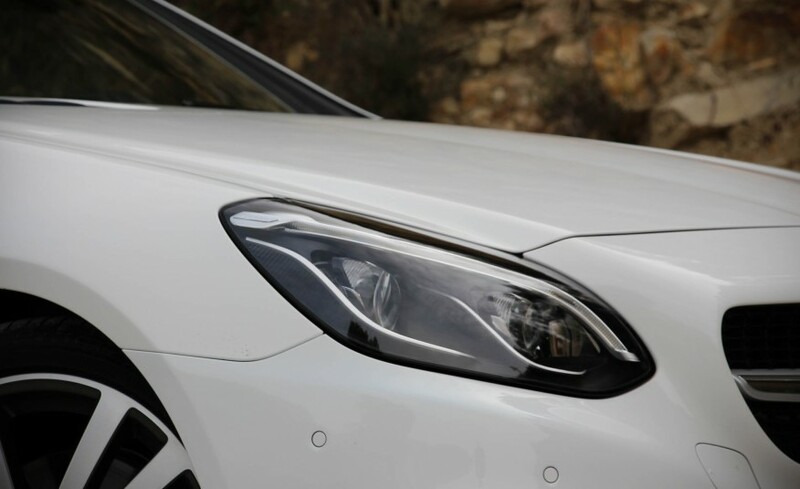 To help the SLC300 better fit in stylistically with Mercedes-Benz's latest models, the SLK's blocky schnoz was replaced by a rounded nose with dual-element headlamps and arching LED brows. A constellation of black or chrome dots orbiting the three-pointed star backfill the bisected grille. At the back there's a new bumper and taillamps with horizontal LED loops. 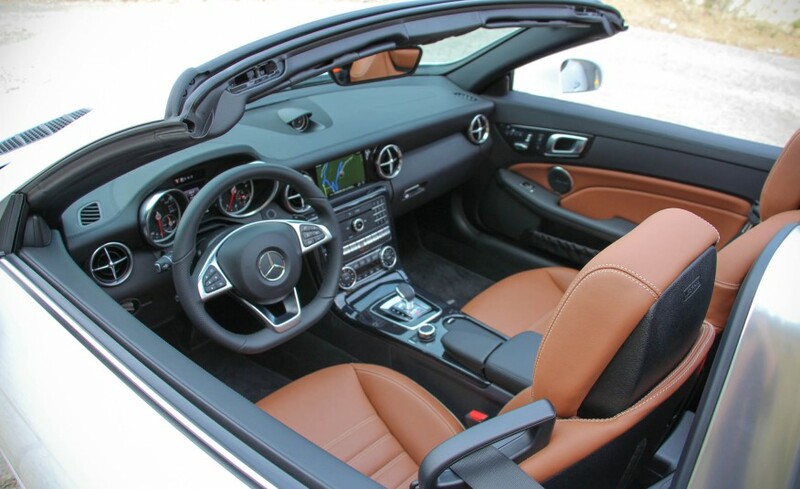 The SLC's cabin is virtually unchanged from that of the SLK, where it has appeared dated for some time. The most significant change is its flat-bottom steering wheel, while black-faced primary gauges, a TFT driver-information screen, and a 7.0-inch infotainment screen round out the functional updates. Contrast stitching and elegant silver buttons and switches are less functional, but they're appreciated. A variable-tint glass roof remains an option for those seeking to brighten the cabin, but if you need it brighter still, the retractable hardtop disappears under the decklid at speeds up to 25 mph. 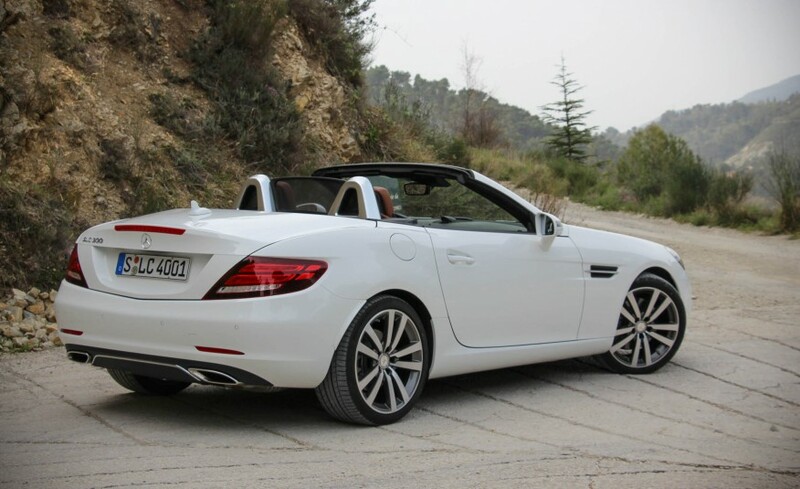 Not surprisingly, the 2.0-liter turbo four's robust output (which we never got a chance to review in the previous SLK) made the rural sweepers north of Nice, France, particularly entertaining, although turbo lag became noticeable on Nice's congested streets. We also were fond of the SLC's accurate steering, stoic high-speed manners, and tidy body motions during some back-road shenanigans. The nine-speed automatic's snappy downshifts under braking made us smile every time. Mercedes claims that the SLC300 can accelerate from zero to 60 mph in 5.7 seconds, an entirely believable number considering we coaxed a 2015 SLK250 with a manual transmission to 60 mph in 6.3 seconds-and that car had 40 fewer horsepower and 44 lb-ft less torque. 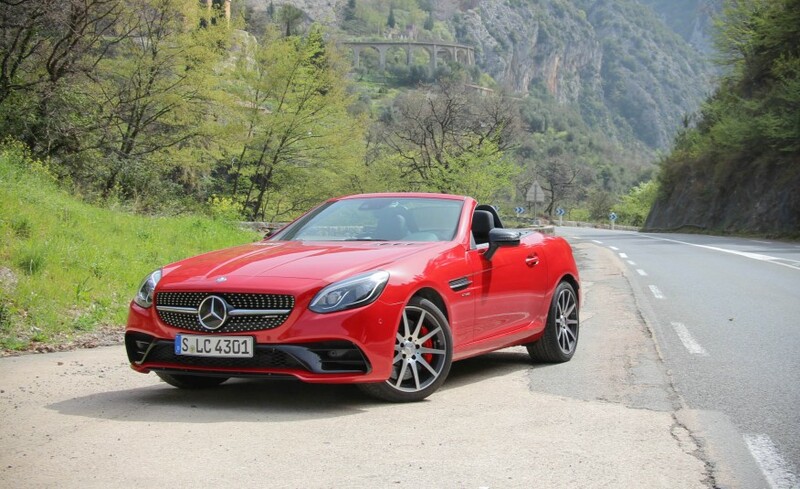 Let's get this out of the way: The Mercedes-AMG SLC43 will never entirely replace the brawny, fast, and occasionally uncouth SLK55 AMG. Its 362-hp twin-turbocharged V-6 can't match the 415 horsepower or the basso profundo sound of the 5.5-liter naturally aspirated V-8. In truth, though, the SLK55 wasn't all that great; it was nose-heavy, thirsty, and not particularly nimble. The SLC43 suffers none of those shortcomings. Sure, its V-6's horsepower is lower, but its 384 lb-ft peak torque is just 14 lb-ft shy of the 5.5-liter's. Even better, it's all on tap from 2000 rpm. 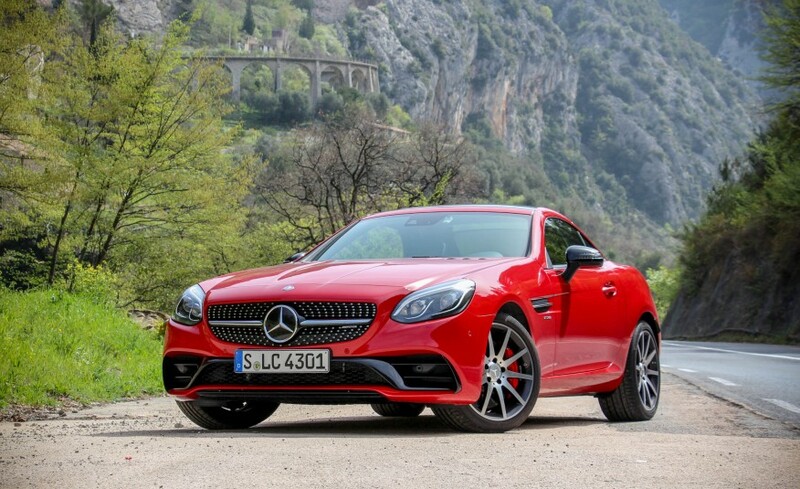 Factor in the SLC43's stated curb weight of 3351 pounds, just 33 more than the SLC300 and some 200 pounds less than the SLK55 AMG, and the SLC43 is a credible SLK55 replacement. Mercedes estimates that the SLC43 can hit 60 mph in 4.6 seconds, 0.1-second slower than the SLK55 AMG's officially stated time, and based on the massive surges of acceleration we experienced whenever we pushed past the throttle's midway point, that mid-four-second zero-to-60-mph time is totally believable. We'll know for sure how the SLC43 stacks up only after we test one, but our best 60-mph sprint in an SLK55 AMG was a close 4.1 seconds. The SLC43's suspension is quite firm, and body roll is virtually nonexistent. Steering is at times heavy but always precise. The optional limited-slip differential proved its worth by keeping the rear tires anchored when powering away from an apex. And the AMG brakes proved impressively fade-proof despite our best efforts to cook them on a high-speed mountain descent beset with low-speed switchbacks. Precious few exterior features distinguish the SLC43 from the SLC300, the most obvious being the full-width front air intakes. 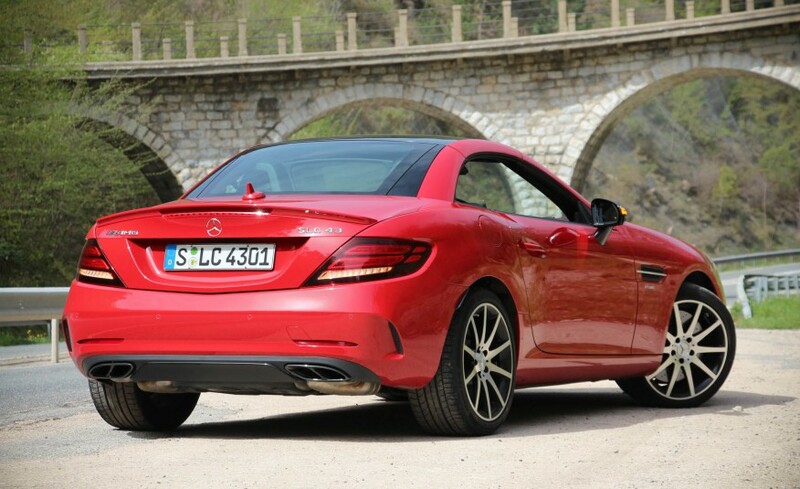 Also specific to the AMG are its rear bumper, quad-element tailpipes, and standard 18-inch wheels that provide a nice view of the SLC43's big brakes. The designers could have dug deeper to make the SLC43's exterior look more special, but the interior feels rightly intense, with sport seats, a contoured sport steering wheel, and AMG instruments with a race timer. Soft nappa leather and microfiber optionally covers most surfaces, punctuated by red stitching and red trim. The 2017 SLC-class arrives by early summer. Pricing isn't yet available, but the SLC300 will probably remain close to the 2016 SLK300's $47,925. 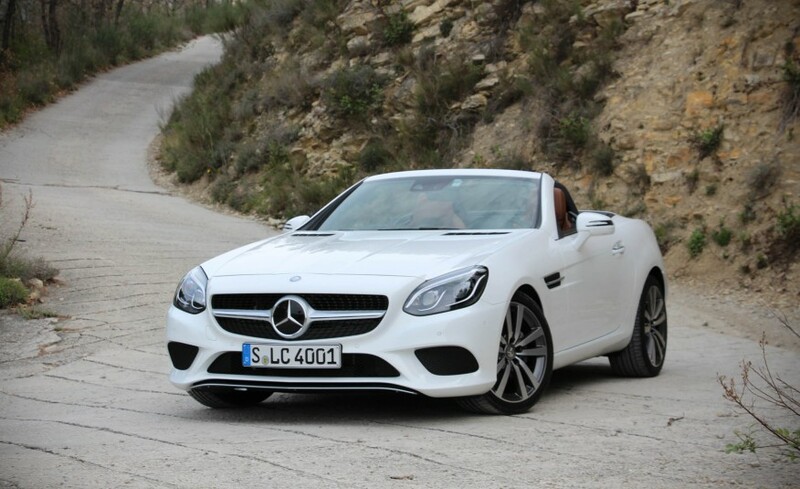 The SLC43 likely will command more than $60K, although it should handily undercut the eye-watering $73,525 that Mercedes charged for the SLK55 AMG. How well it will sell is anyone's guess, especially in this depressed roadster market. But with all the effort Mercedes put into what was ultimately just a mid-cycle refresh for the SLK-class, the carmaker clearly intends to sell the car for a while.